Barclays CEO Bob Diamond announced his resignation earlier this week in response to the controversy. 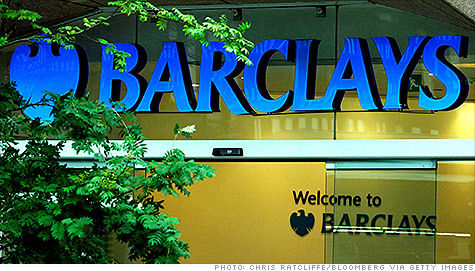 NEW YORK (CNNMoney) -- The Libor interest-rate-fixing scandal has already cost Barclays more than $450 million. For the British banking giant and others, however, that could be just the beginning. Two dozen lawsuits have been filed against banks involved in setting Libor by plaintiffs who claim they lost money as a result of the rate's manipulation. And that's just in the United States -- given Libor's global reach, investors around the world may have cases. Libor -- or the London Interbank Offered Rate -- is the world's most important benchmark for interest rates. Roughly $10 trillion in loans -- including credit card rates, car loans, student loans and adjustable-rate mortgages -- as well as some $350 trillion in derivatives are tied to Libor. Libor rates are generated each business day in London when a group of large banks are asked what interest rate they would have to pay to borrow money for a certain period of time and in a certain currency. The responses are collected by Thomson Reuters, which removes a certain percentage of the highest and lowest figures before calculating the averages and creating the Libor quotes. In the United States, the civil suits focus on allegations that the banks made artificially low Libor submissions, particularly during the financial crisis. In its settlement last week with U.S. and U.K. regulators, Barclays (BCS) admitted this, afraid that if its submissions were too high, it would get punished in the markets as investors questioned its health. The bank claims it was only following the lead of other institutions engaged in the same behavior. Separately, Barclays acknowledged that its traders had asked colleagues in charge of the Libor process to tailor the bank's submissions to benefit their trading positions as far back as 2005. Barclays staffers also colluded with counterparts from other banks in attempts to manipulate rates, according to the settlement. The scandal now appears poised to spread beyond Barclays; firms including Deutsche Bank (DB), Royal Bank of Scotland (RBS), Credit Suisse (CS), Citigroup (C, Fortune 500), UBS (UBS) and JPMorgan Chase (JPM, Fortune 500) have disclosed that they are being investigated. The U.S. Libor lawsuits have been consolidated into a single case in Manhattan federal court. The case brings together a varied group of plaintiffs, ranging from individual traders to brokerage firm Charles Schwab (SCHW, Fortune 500) to the City of Baltimore. Broadly speaking, the plaintiffs claim they lost money on Libor-related securities when the banks kept the rate artificially low. "They were setting the rates for Libor at the same time that they were in the market transacting with people in instruments that were keyed to Libor," said Arun Subramanian, a lawyer representing Baltimore. "To me, this doesn't seem like anything different than a normal, anti-trust conspiracy." In one suit, for example, Charles Schwab claims one of its investment funds purchased debt securities from the banks in which the interest payments rose and fell with Libor. With Libor's alleged suppression, Charles Schwab says, it was deprived of the higher interest payments it deserved. In another complaint, individual investor Ellen Gelboim claims she purchased corporate bonds that paid variable interest based on Libor, and suffered lower returns as the banks held the rate down. In all, the lawsuits consolidated in New York target more than a dozen banks involved in the Libor process. Lloyd's Banking Group said that along with others in the sector, it is "assisting various regulators in their ongoing investigations," declining to comment further. The other banks involved either declined to comment or did not respond to requests for comment. Last week, a number of banks filed motions in Manhattan court to have the suits against them dismissed. Among other things, they argued that the plaintiffs' cases are based on unsubstantiated reports, and that there is no evidence that the banks conspired together to keep Libor low. Losses claimed from alleged Libor manipulation, one motion added, are "too indirect and speculative." Barclays offered qualified support for these arguments, though it noted that it could not contradict its admissions in last week's settlement with regulators. That settlement offers reams of detail about Barclays' fraudulent Libor submissions and its apparent collusion with other firms. This evidence could be used to support the civil suits, along with the additional settlements expected from other banks. "The language of the agreements with the government is going to provide great ammunition," said Michael Weinstein, a white-collar defense expert at the law firm Cole Schotz and a former federal prosecutor. Weinstein said it's difficult to say how cases against the various banks will play out, but that the liability for some could stretch into the hundreds of millions of dollars. "I don't think the story has fully been told yet," he said.